I wrote last May, almost one year ago to the day, that AB 51 in its then-current form would codify lane splitting in a reasonable way, and open things up for the CHP, OTS, and other organizations to educate riders and drivers again, which would be a really good thing. A quick refresher—the bill, as amended at that time would basically codify splitting at up to 50 MPH, with a speed delta of up to 15 MPH. These numbers were determined based on analysis by Dr. Tom Rice of UC Berkeley / SafeTREC. You can read Dr. Rice’s lane splitting research here. After that, the bill was tabled for the 2015 session, due to concerns that it wouldn’t pass. I worried that it would just quietly die in 2016, like SB 350—after all, Quirk promised us during our meetings in early 2015 that he’d kill the bill rather than reduce the speed limit and delta to levels inconsistent with Dr. Rice’s research. I received a note from Assemblyman Quirk’s office this afternoon that the bill would be further amended before continuing in the Senate. In nearly best case scenario, Quirk will amend the bill in such a way that lane splitting is defined, and remains legal by virtue of not being prohibited—remember, that which is not illegal is legal—with specific language stating that the CHP may develop guidelines about splitting to educate riders and drivers. Put simply—lane splitting will remain legal, as it’s always been, and the CHP and other organizations can go back to educating road users about splitting without fear of retaliation via trumped-up “underground regulations” accusations. (a) For purposes of this section, “lane splitting” means driving a motorcycle, as defined in Section 400, that has two wheels in contact with the ground between rows of stopped or moving vehicles in the same lane, including both divided and undivided streets, roads, or highways. 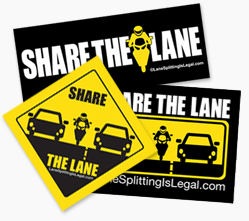 (b) The California Department of Highway Patrol may develop educational guidelines relating to lane splitting in a manner that would ensure the safety of the motorcyclist and the drivers and passengers of the surrounding vehicles. The bill will be submitted to committee in this form this coming Tuesday, May 31st. Of course, it remains to be seen whether this bill will pass, but this is excellent news. I urge you to contact your state senator and ask them to support this bill—you can find your legislator here. Stay tuned here or to the LaneSplittingIsLegal Facebook page—we’ll keep you informed as the bill makes its way forward. Updated by CHP & DMV by taking Lane Splitting Safety Guidelines off their websites due to the misinterpretations they created. Lane splitting will never be legalize, allowable is all you’re ever going to get, enjoy that while you can, and please ride safe!